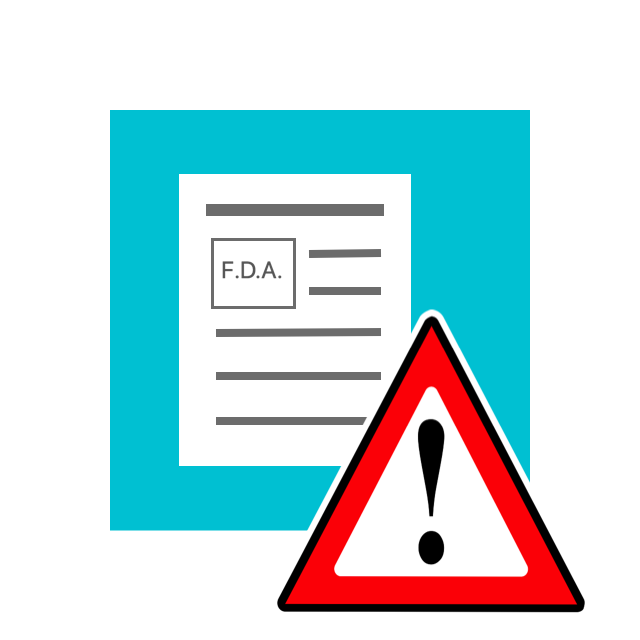 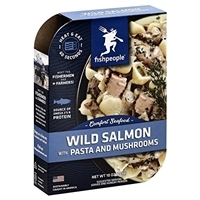 WATER, CREAM, SALMON, ENRICHED PASTA (DURUM SEMOLINA, EGG WHITES, NIACIN, FERROUS SULFATE, THAIMINE MONONITRATE, RIBOFLAVIN, FOLIC ACID), ONIONS, BUTTER, MUSHROOMS, CORN STARCH, CONTAINS 2% OR LESS OF BALSAMIC VINEGAR, PARMESAN CHEESE (PASTEURIZED MILK, CHEESE CULTURE, SALT, ENZYMES), FRENCH BRANDY, ANCHOVY SAUCE, PARSLEY, ORGANIC LEMON JUICE, SALT, THYME, ORGANIC CRACKED BLACK PEPPERCORNS, SOY LECITHIN, MUSHROOM POWDER. 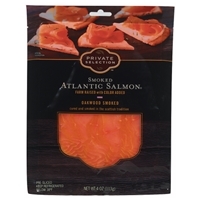 Brand/Manufacturer: Private Selection Inter-American Products, Inc.
Farm raised atlantic salmon with color added, salt, sodium nitrite (preservative), natural hardwood smoke. 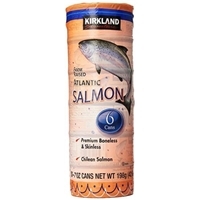 SALMON, WATER, SALT, COLOR ADDED. 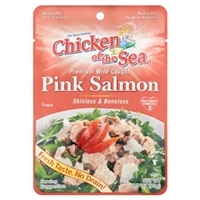 Pink salmon, sodium tripolyphosphate (added to retain moisture). 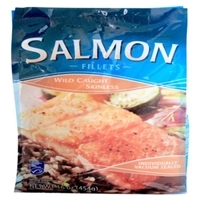 Pink salmon, water, vegetable broth (contains soy), salt. 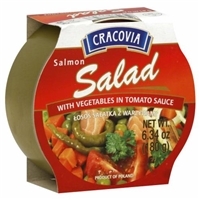 Brand/Manufacturer: Cracovia EAGLE DISTRIBUTED, INC.
Tomato sauce: water, tomato puree, sugar, sunflower oil, wheat flour, seasonings: paprika, onion, parsley, celery, pepper, salt, salmon pieces (45%), vegetable blend (20%) (pea, carrot, potatoes).contains: wheat, salmon, celery, onion. 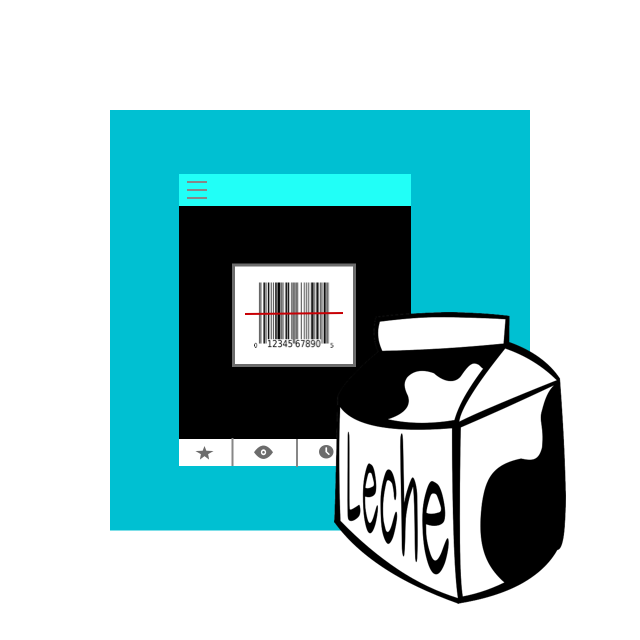 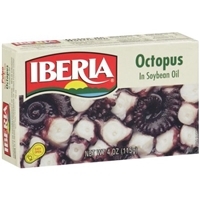 Brand/Manufacturer: Iberia iberia foods corp.
Cephalopod tentacles, soybean oil and salt. Vegetables (55%): carrot, onion, red pepper, pea, string bean, salmon pieces (25%), tomato paste: tomato puree, water, sugar, salt, seasonings: chilli, garlic dried vegetables: carrot, parsley, onion, celery. 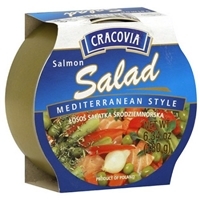 Provencal herbs, sunflower oil. 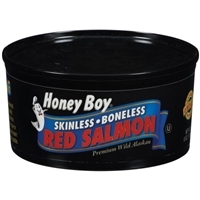 Contains: celery, salmon, onion, garlic. 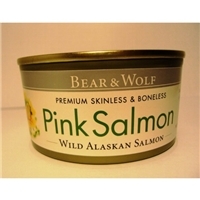 ALASKAN PINK SALMON AND SALT.